If you aren’t happy with your smile one easy and economical solution could be porcelain veneers. Veneers are great for fixing multiple cosmetic flaws and upgrading your smile. If your teeth are stained, discoloured, gapped, ground down, misshapen or poorly sized, porcelain veneers can be just the treatment to give you a beautiful smile that can last for decades. Although they are economical, veneers are an investment, so you might wonder, “What can I do to ensure my porcelain veneers look stunning for as long as they can?” At Forster Dental Centre we are happy to answer this question for you, so you know how to make your porcelain veneers stand the test of time. Dental veneers are wafer-thin shells of tooth-colored porcelain that are cemented over the surfaces of your teeth. Although veneers are a cosmetic dental treatment, they also offer protective qualities and can replace more extensive and expensive treatments. Additional benefits are durability, an improved smile appearance, and the need for little-to-no removal of tooth structure compared to crowns. What Is The Expected Lifespan Of A Veneer? With good care and taking sensible precautions, porcelain veneers can last from 10 to 30 years. Because dental veneers are not indestructible it is important to take reasonable precautions. You can pretty much eat whatever you want, but remember that porcelain is a kind of glass and can break under too much pressure. Basically, porcelain veneers have strengths and weaknesses similar to those of a natural tooth and should be taken care similarly. What Can I Do To Preserve My Veneers? The look and shape of a porcelain veneer can alter the general appearance of your teeth once they are on your teeth. There are generic porcelain veneers and veneers that are specifically made for you. Generic veneers are cheaper but in general aren’t as aesthetically pleasing as custom-designed ones. Choose veneers specifically designed for you by Forster Dental Centre for maximum satisfaction and best appearance. Your veneers should be taken as important as your real teeth. Brush and floss regularly, keep them clean and you’ll have great looking veneers that’ll last decades. Also, remember that if the tooth underlying a veneer becomes too damaged, the veneer and the tooth can be lost. There are creams and compounds in the market today created specifically for treating veneers. Ask you dentist about them. These compounds and creams help provide a protective layer to your veneers, in effect lengthening their lifespan. Don’t eat sugary, starchy or acidic foods, and be careful with hard or sticky ones. Stay away from food and drinks like coffee, aerated drinks, red wine, tea, berries etc. that can be staining. If possible avoid smoking as well! Biting on hard objects is a quick way to damage porcelain veneers. Don’t open metal caps or crack hard-shelled foods like walnut. Veneers or not, never subject your teeth to unnecessary impact. If you have to engage in activities that can potentially affect your teeth due to impacts, wear a mouth guard. People who engage in sports are often faced with this prospect. For people who are not accustomed to wearing mouth guards, it can be a bit unsettling at first but over time you’ll get used to it. Protect your mouth at all times! Some patients need to wear devices to keep them from damaging their veneers while sleeping. Typically these devices are mouth guards recommended for people who grind or clench their teeth while asleep. These protective devices can be the difference between waking up with your veneers in place and gleaming, or a trip to the dentist to have repair work. Your veneers should be checked regularly. This is to ensure that they are in top condition. 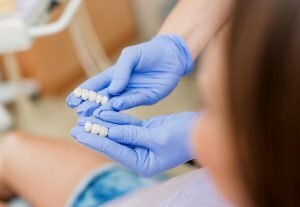 Your dentist will also be able to determine if your veneers remain attached correctly or if you need to have some work done on them to fortify their attachment to your existing teeth. At Forster Dental Centre, we provide each patient the care that allows him or her to maintain healthy teeth and a beautiful smile for life! We provide an extensive range of dental services from preventative dentistry to restorative dental options along with the latest in cosmetic dentistry solutions for straighter and whiter teeth.